Mushroom & Blue Cheese Ragout is one of those recipes that makes anything you serve with it, better. You can already tell by the photos, it’s not the tomato or meat based ragu we all love on pasta. Although when you taste this you might be tempted to pour it over pasta, or sandwiches, or eggs, or waffles … well, maybe not waffles, but you get the idea. Several of our friends swooned over this sauce at various gatherings and it was on my mom’s list of recipes she wanted to take home after her visit last month. When I include Beef Tenderloin with Mushroom Ragout on the menu for a party, there is usually at least one person expecting a red sauce. Then the question comes up about the difference between ragout and ragu because it sounds the same, though the two are quite different. This post is for anyone else wondering the same thing. Oh, and the recipe is roll-your-eyes-up-in-your-head good too. What’s the difference between ragout and ragu? Both come from the French word ragoûter (“to revive the taste”) and it is believed the ragus of Italy were influenced by ragouts of France due to Napoleon’s occupation of what is now the northern regions of Italy in the late 1700s. Also noteworthy is the influence of Italian cooks on French cuisine when Catherine de Medici married into French royalty in the mid 1500s. The Italians may point out they first influenced French cuisine and the French may infer that they in turn refined it, but it is undeniable we have all benefited. Ragout and ragu are usually thick, long simmered and well seasoned. Ragu is typically a sauce for pasta and ragout is more like a stew, which can also be served as a sauce with meat like the recipe I offer here. Ragout: A thick, seasoned French stew or sauce made with meat, fish, or vegetables. Ragu: An Italian tomato and/or meat sauce, depending on the region in which the recipe originated. Does a brief history lesson help? Of course, once you taste it you may not even care if you know the difference, so long as there is enough for seconds. 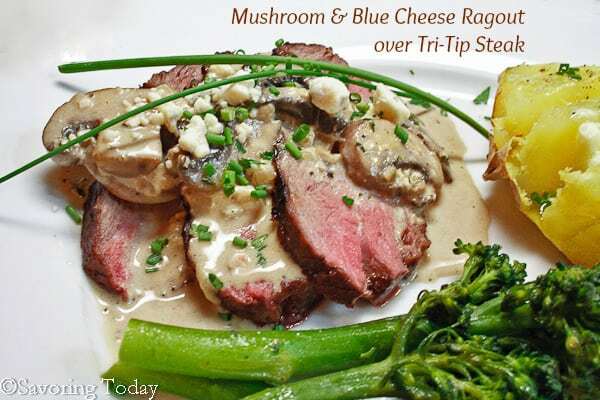 Fresh thyme accents the meaty flavor of crimini mushrooms and Blue cheese brings umami to the luxurious sauce. Depending on the Blue cheese you use and the amount, you may not need to add salt and pepper at all. Naturally thickened with cream, there’s no gluten to worry about so it’s safe for our gluten-free friends. 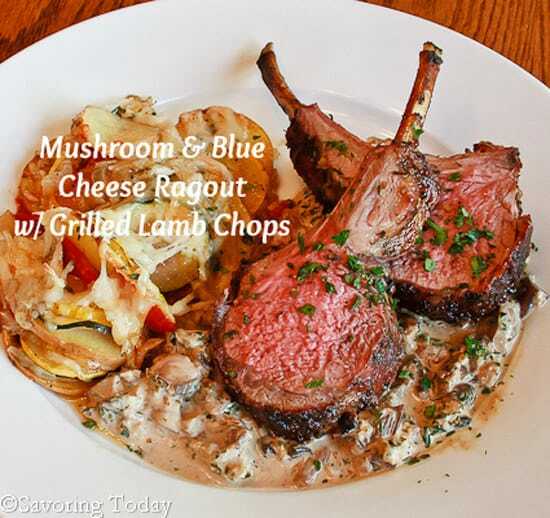 Mushroom & Blue Cheese Ragout is a sumptuous sauce ideal for roasted or grilled beef, lamb, pork chops, or wild game—it makes any occasion special. 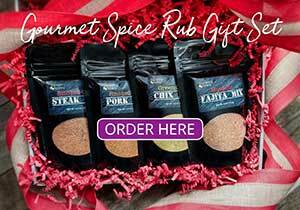 A sumptuous sauce ideal for roasted or grilled beef, lamb, pork chops, or wild game. In a 10 inch skillet, heat 2 tablespoons of olive oil over medium heat with onions. Cook until onion is softened, 3-4 minutes, then add an additional tablespoon of oil and the mushrooms to the skillet with the onions. Salt and pepper mushrooms and cook until the mushrooms have released their liquid and browned, about 10-12 minutes. Try not to stir too much so the mushrooms have a chance to brown. Add the Marsala, chicken stock, and thyme to the skillet, stir to loosen browned bits, and cook until most of the liquid evaporates, 2-3 minutes. Reduce heat to medium-low, add the cream and simmer for 2-3 minutes to allow cream to reduce and create a sauce. Stir in blue cheese and parsley (more blue cheese can be added according to preference); salt and pepper to taste. Garnish with additional blue cheese or parsley and serve warm. A range of mushrooms can be used for this sauce--porcini, shitake, morel--anything woodsy and hearty. The ragout can be made hours in advance and gently reheated just before serving. Add chicken stock or cream to thin the sauce, as desired. Gluten-Free: This recipe as written is gluten-free, however, if using chicken stock from the store, check the packaging or the manufacturer to be sure it is gluten-free. What are the sides on the picture of the ragout on the beef tenderloin and the one on the lamb chops? Do you have a recipe for them on your site? The side with the lamb chops is Vegetable Tian, which I have not yet posted. Honey messed up and got veal chops instead of lamb chops lol, but it was awesome anyway. this one is definitely going in the go to book. It was every good as it looks. Judy, that looks SO good. I can’t eat blue cheese like I used to when I was younger – it’s a bit too rich for me these days – but I can just look at that photo and imagine exactly what it must taste like! This is one great recipe, Judy, and I can see why it is a favorite. Normally, I’m not one for sauces served with steaks. I’d gladly make an exception for this ragout, however. It really does sound wonderful. Thanks for both the recipe and history lesson. Well you just took ragout to a whole new level! Great information on ragout vs. ragu – thanks! What a fabulous recipe! I can definitely see serving this in many ways. 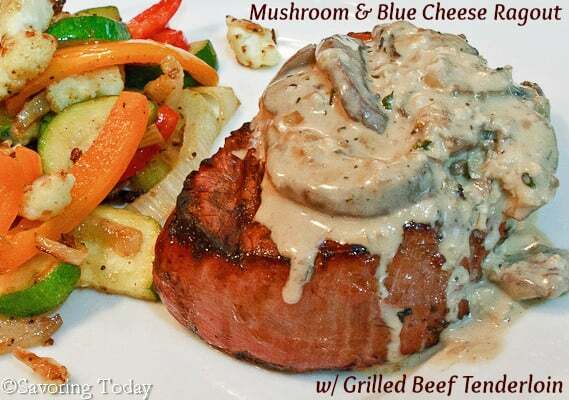 I’ve always loved a little bleu cheese on steaks, but the idea of a bleu cheese mushroom ragout has me wanting to run about and buy some steaks or lamb chops. Thanks for a fabulous supper idea! Great post! Spectacular recipe – this looks totally delish, and something I definitely want to make. Great lesson on the distinction between ragu and ragout, too. Next we should probably discuss the difference between a fricassee and a stew! Food terms are usually pretty obvious, but sometimes do have subtle but important distinctions, as you pointed out. 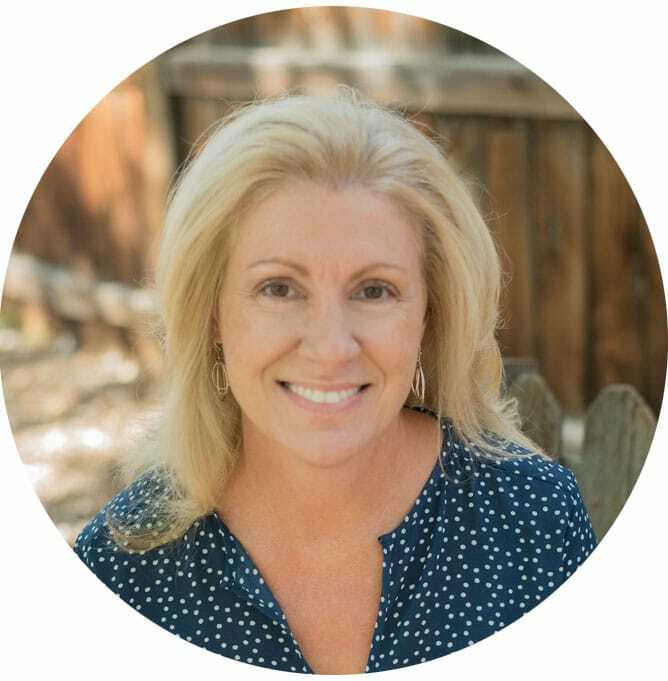 Really fun read – thanks. My French family had ragout but the first time I had an Italian friend I was sure we were talking about the same thing. I love your dish!